Bust N/A 34.5" 35" 35.5" 37.5"
Waist N/A 30" 30" 31" 31.5"
This women’s mini dress is one that is perfect for travel, or for any casual daytime event. 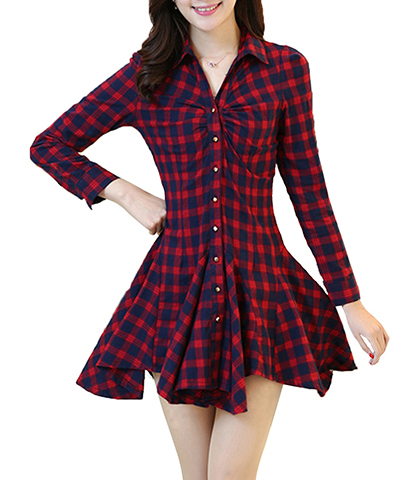 It is presented in a lovely red plaid that is accented in black. The dress buttons down the front with white buttons and has long sleeves. The full skirt is short, with the hemline ending at the upper thigh area. The dress features a vee neckline and has a pointed collar. This dress is machine washable in warm water and can be tumbled dry on a low heat setting. The dress is available for purchase in sizes Small, Medium, Large and Extra Large.